The Rose MultiStation PC (MSP-PC42-XP) represents the latest in multi-user PC technology at affordable prices. 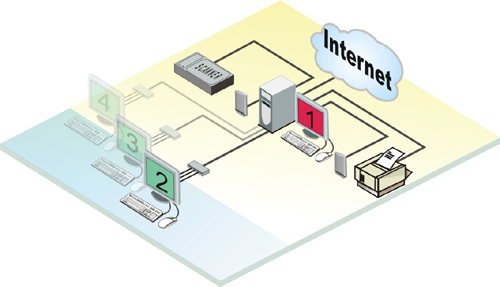 The Rose MultiStation PC (MSP-PC42-XP) allows up to four users to connect to a single, centralized windows computer. Each user is completely independent with their own desktop, colors, and operating environment. The Rose MultiStation PC (MSP-PC42-XP) is ideal for home environments when one computer needs to be shared between family members. Schools and small offices can reduce expenses by installing the MultiStation PC. Instead of having a computer for each student, four students can share a single computer. Industries that need to locate a computer away from a manufacturing floor and in a safe clean area can still access it up to 50 feet away. Note: This card & remote combo is for 1 local console and 1 remote console only. An additional card is required for each additional users (3, 4, as in diagram below).